Moscow Blast May Not Spur More U.S. Security Monday's bombing took place at the unsecured arrivals area of Moscow's airport. But domestic airport officials say that won't change their plans for protecting travelers outside heavily monitored boarding areas. Moscow Blast May Not Lead To More Security In U.S.
Police officers walk with a sniffing dog through Domodedovo Airport in Moscow after a blast that killed dozens of people. 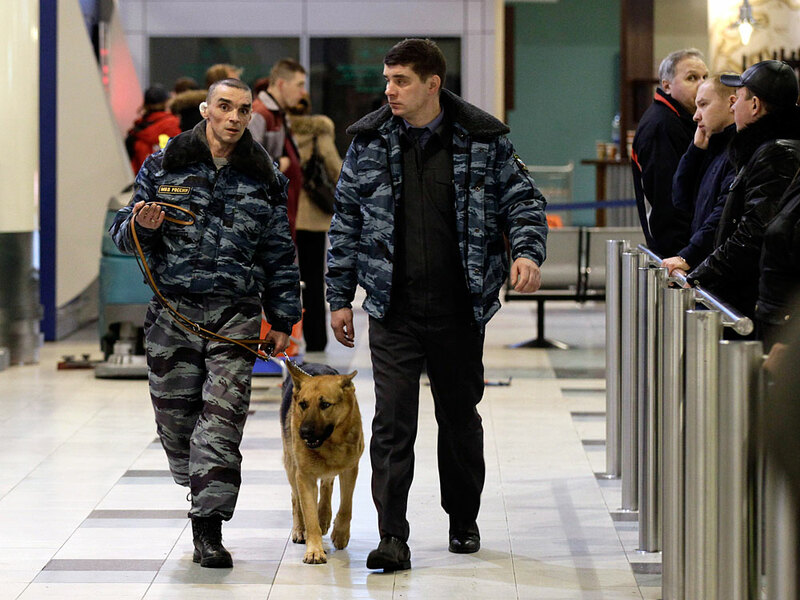 Following Monday's bombing in Moscow, U.S. airports may step up surveillance efforts in less-secure areas. But it doesn't appear that travelers will encounter more visible obstructions, such as additional identification checks. Security experts say there is little interest in shutting off additional parts of airports to nonticketed passengers. Airport officials could attempt to secure more areas — but that would only shift potential problems to new areas, they say. "You're just moving the target," says Mark Crosby, the security chief for the airport in Portland, Ore. "Whether it happens in front of the building or in the middle of the building, the headline is still going to say that there's an event at their airport." Although there have been bombings and shootings at hotels and other locations, terrorists prefer to target modes of transportation — airplanes, subways, trains — experts say. "Mass transportation is so tightly tied to a world economy," says J. Bennet Waters, a former official with the Department of Homeland Security and the Transportation Security Administration who is now with the Chertoff Group, a security consulting firm. "As we saw with 9/11, the ability to disrupt people's comfort with using all modes of transportation has an impact on the economic environment," Waters says. An uptick in the rigor of screenings has made it more difficult to bring down airplanes. This may be one reason why terrorists targeted the unsecured arrivals area at Moscow's Domodedovo Airport, killing 35 people and injuring more than 100 others. You cannot reasonably secure everybody all of the time. You secure baggage claim, then somebody's going to detonate something in the parking lot. Despite the heavy toll, security experts say U.S. airports are unlikely to change their game plans radically in response. "What happened in Moscow should have no effect," says Richard Bloom, a professor and administrator at Embry-Riddle Aeronautical University in Arizona. There already is considerable security outside of what airport officials call the "pre-sterile areas" — outside the boarding gates where all passengers and personnel have gone through screenings, Bloom says. "We have many layers of security, and we're much more secure than most public facilities," says Crosby, the Portland public safety chief. In addition to the on-site protection afforded by dogs and guards, Bloom says, airports rely on outside agencies — including the CIA, FBI and local law enforcement — to provide them with warnings of potential threats. "It all begins with the intelligence you collect," Bloom says. "If you're going to spend more money on areas before people get to the gate and put more of the resources into the uncontrolled areas, that would only be done because the intelligence information shows that's what you should do." Some airports overseas — notably, Tel Aviv's Ben Gurion International — set up security perimeters well outside the terminal buildings, having all passengers go through checkpoints before they even come near the airport proper. An unmanned vehicle helps secure the runway at Ben Gurion airport near Tel Aviv, Israel, on Nov. 2. 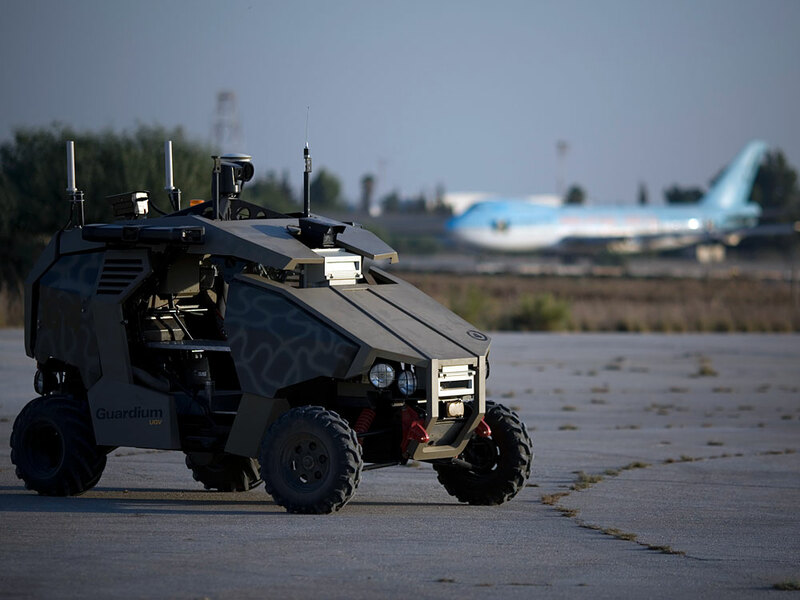 Ben Gurion is among the overseas airports that set up security perimeters well outside the terminal buildings. "If, God forbid, there was a Moscow-style attack here in the U.S., you would see pressure here to have checkpoints where cars come in, where people come in," says Jeffrey Goldberg, a national correspondent and blogger for The Atlantic who has written frequently about inadequacies in airport security. Goldberg recognizes that the current conventional wisdom among security experts holds that domestic airports do not need to secure more of their property. But conventional wisdom changes over time. "If you told people 20 years ago that you would be body-scanned, patted down, not be allowed to carry liquids on planes and have a federal bureaucracy designed to inspect all aspects of your person and possessions," he says, "people would say 'that will never be allowed to happen.' "
An experienced world traveler, Goldberg says he is not nervous about flying. But he does get nervous waiting in the security line at the airport, "where you're all bunched up" and provide a ripe target for bombers. Airport lobbies and pre-security areas, he says, are "awesomely vulnerable." But Waters, the Chertoff Group director, says such areas are safer than they may appear. "A number of steps have been taken to provide for security that may not be visible to the public," he says. Just as terrorists adapt to the security regimes they see in place, Waters says, security officials change their strategies all the time. But they can't shut off public facilities like airports altogether. "This is a question of finding the right balance between security and restricting the flow of goods and people," he says. In recent weeks, many American travelers have objected to intrusive TSA tactics, such as new screening machines and full-body pat-downs. The explosion in Moscow may lead to greater tolerance for such hassles, at least for a while. Security experts and policymakers also may respond to the bombing with calls for renewed vigilance, says Gary Shiffman, director of homeland security studies at Georgetown University. But no one should expect that airports will become perfectly safe. "You cannot reasonably secure everybody all of the time," Shiffman says. "You secure baggage claim, then somebody's going to detonate something in the parking lot." Ultimately, Shiffman says, perfect security is a chimera. There will always be vulnerabilities. Especially in a public place where it's perfectly normal to be seen carrying a backpack or large bag. "Security is risk management," he says. "People are always going to be able to get through whatever sort of defenses you put up. The goal is to make the high-value targets harder to strike."